Ask any chef and they will tell you that a good knife is their most valuable tool. Knives are designed with a specific purpose in mind and choosing the correct knife is as important as selecting the right ingredients for a recipe. Choose wisely. We proudly feature the following brands: SCANPAN and Zyliss. Stainless Steel Collection of knives are made from Japanese high quality stainless steel. 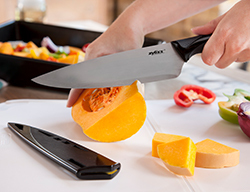 These knives are comfortable and easy to use with soft touch grip handle to give each cook a more precise and controlled cut. Each of the knives comes with a matching blade cover and 5 year warranty. The handle now has a more ergonomic design, and thus provides a solid grip, even when weight is applied. The shape of the shoulder allows the knife to be held in a pinch grip, where the thumb and index finger sit forwards on the spine of the blade for enhanced efficiency and precision. Moreover, the spine is rounded for greater finger comfort. 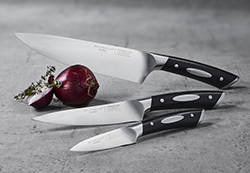 The series comprises a variety of different knife types which are designed for by far the majority of cutting tasks. SCANPAN Classic is an extensive series of functional and elegant kitchen knives which handle the most demanding tasks.